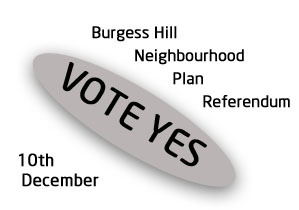 Neighbourhood Plan Referendum - 10th December - Burgess Hill Labour Party recommends a “Yes” vote. 04/12/2015 - Neighbourhood Plan Referendum - 10th December - Burgess Hill Labour Party recommends a “Yes” vote. Given that the town is already committed to accepting substantial new housing development the Neighbourhood Plan will protect our green and environmental heritage from Developers. Burgess Hill Labour Party acknowledges the difficulties of delivering what is a 20 year plan. As the town’s population steadily increases then robust leadership is required from councillors, business leaders and the community to ensure that delivery of the plan is realistic and kept in the hands of local Burgess Hill people. Voting NO will just provide a free for all where Developers will continue to do as they like and will continue to ignore the local Community (as with the Keymer Tiles site) and will reduce the amount they are required to pay for infrastructure improvement to whatever they can get away with.